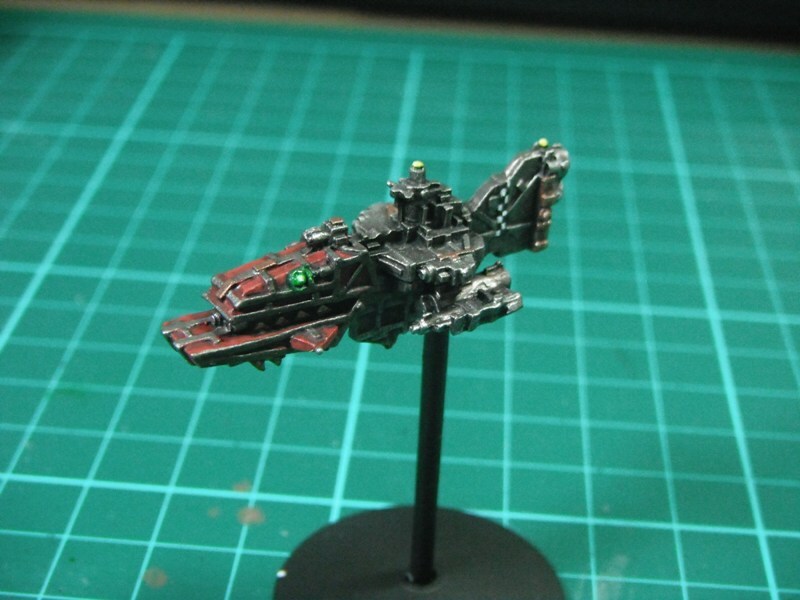 Before painting he whole fleet I decided to paint one model to completion to get the colour scheme right. 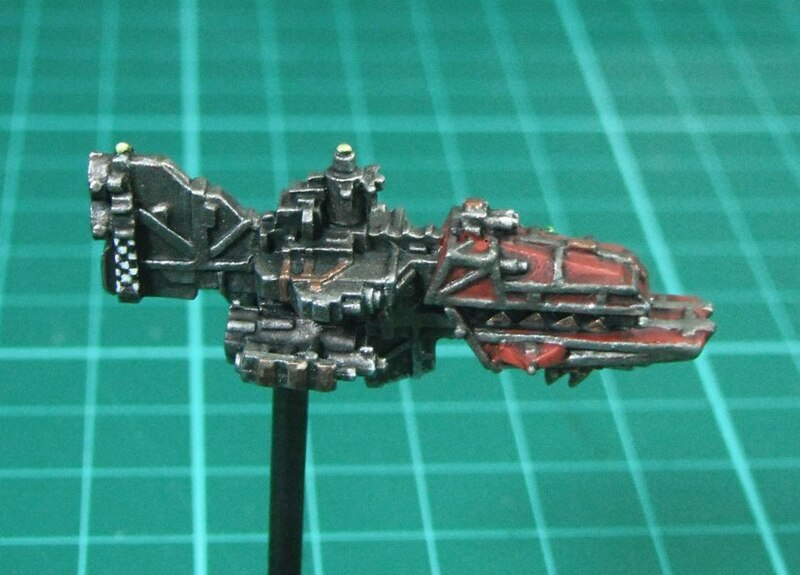 From the outset I knew I wanted a dirty metallic look to the ships with red details. Once I finished painting all of the ships a metallic colour I decided to use one of the escorts to see how the red looked. For the red I used a 50/50 mix of Khorne Red and Mournfang Brown highlighted by adding increasing amounts of Evil Suns Scarlet. I also chose to paint on tiny checks to break up some of the metallic areas and to give a sense of scale. The smaller the checks the bigger the ship looks. Overall I am pleased with the results. 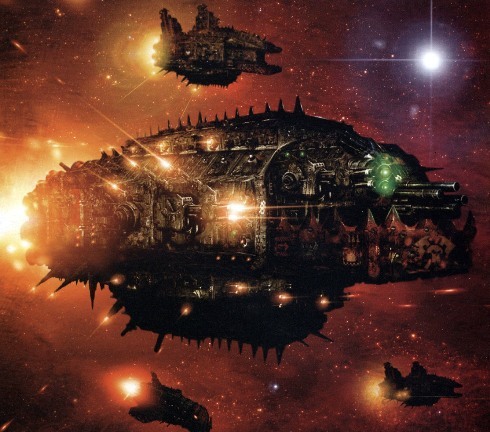 One of the inspirations for the fleet was the following piece of artwork which I found online. I decided to try and copy the glowing green eye on my models. For this I used a mix of Dark Angels Green and Putrid Green (an old Citadel paint) and highlighted this Putrid Green followed by Putrid Green and White Scar. This was then washed with thinned Thrakka Green and a tiny white dot was applied in the centre. I am still not totally sold on the effect but the green does add a nice contrast to the red and provides a strong focal point, drawing the eye to the ‘face’ of the ship. I may refine the green glow effect further as I paint the other ships. 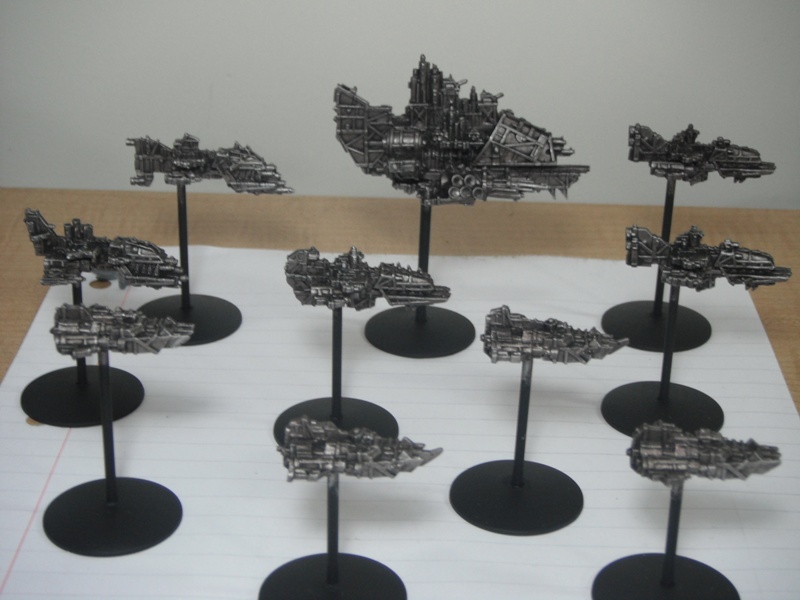 I recently decided to start a new fleet for Battlefleet Gothic. 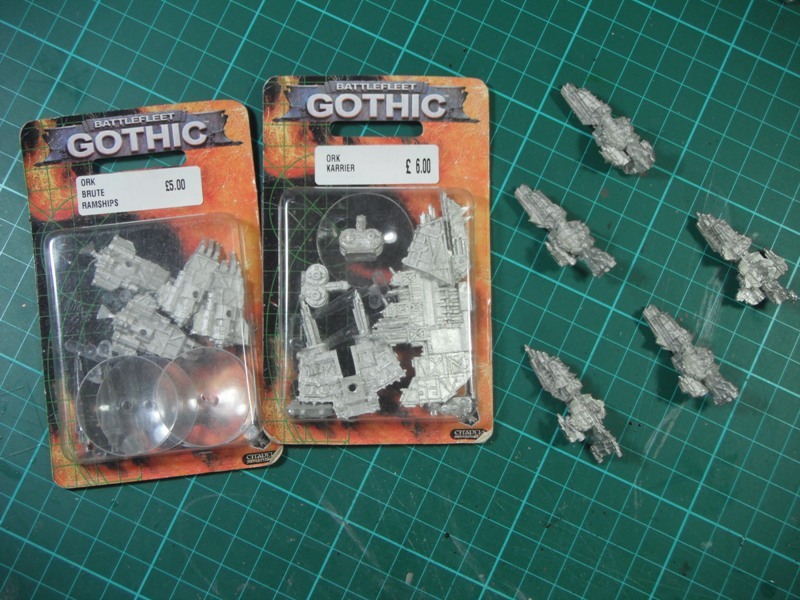 I’ve always had a soft spot for Battlefleet Gothic; the miniatures are great and have really stood the test of time. What’s more, I really enjoyed painting my Imperial Fleet and, with a few simple techniques, the models are quick and easy to paint. 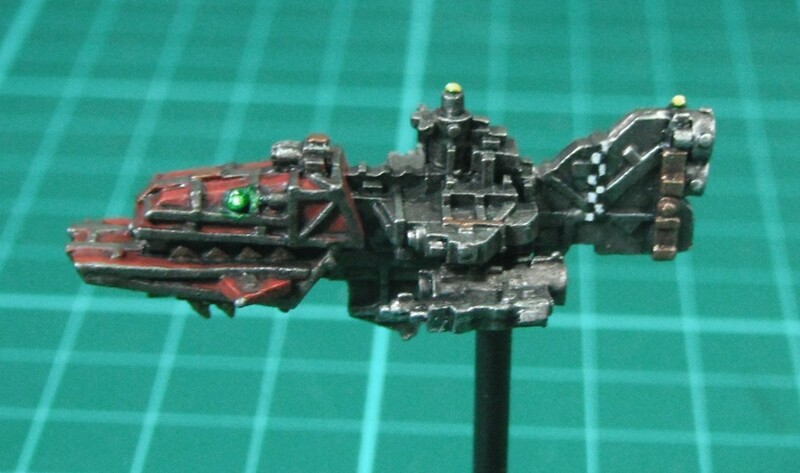 For my second fleet I settled on Orks as I have always liked the race and I really like the models with their ‘aquatic predator’ look. 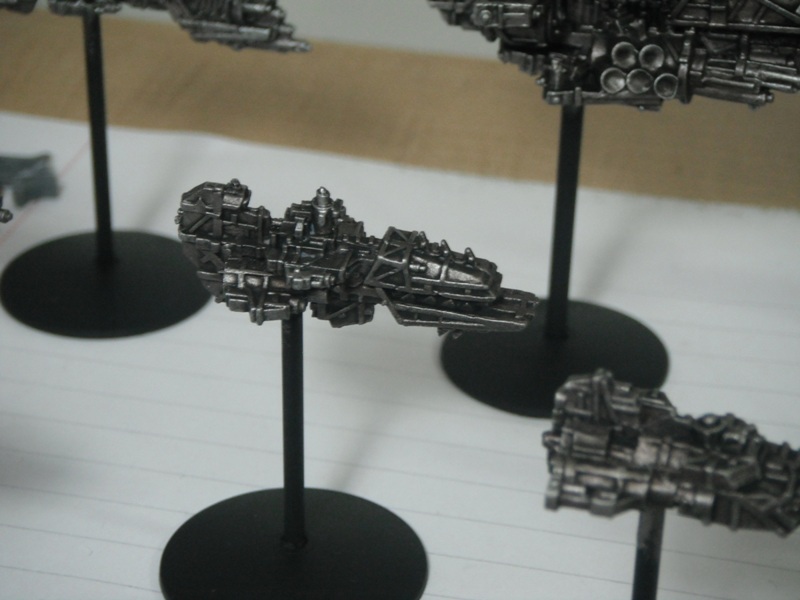 I also managed to pick up a few ships quite cheaply on ebay (which, coincidentally, work out at exactly 500 points) which was pleasing as a number of BFG ships sell for crazy prices since the game was discontinued. 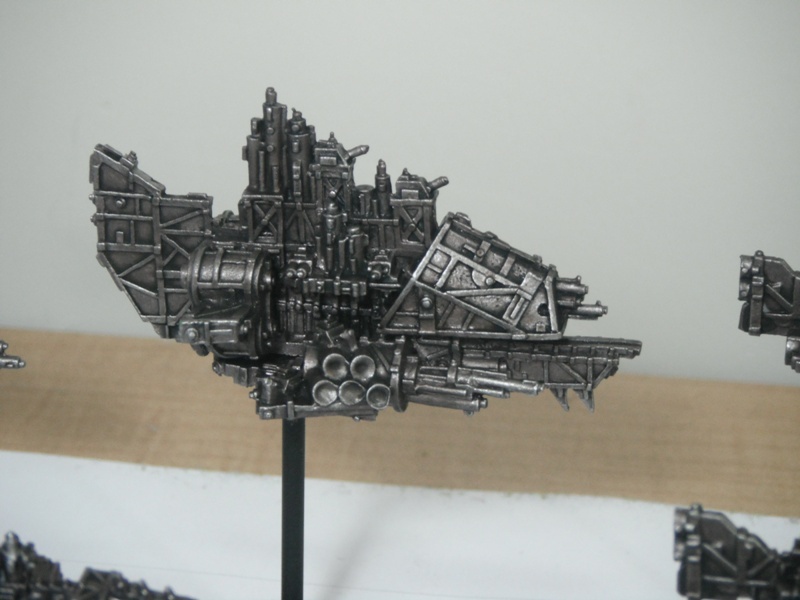 One thing that is worth noting about both my Ork and Imperial fleets is the way I have based them. 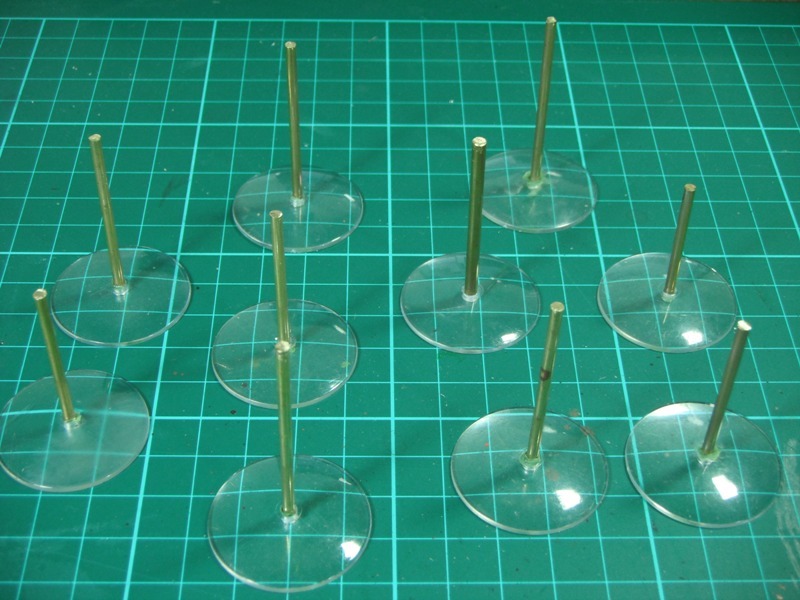 Although I have used the standard GW flying bases I have replaced the fragile stems with lengths of brass rod. This gives the stands increased durability and, although cutting and filing all of that brass rod was a real pain, is definitely worth the effort. As I think BFG stands look better painted black anyway it does not matter that you lose the transparency of the plastic. If you are going to do this than I suggest you find a thickness of brass rod which fits snugly in the hole in the base of the stand and then use a drill bit to widen the sockets on the ships. Don’t worry if the rod is a bit loose as you can always secure it with a bit of putty. BFG models really benefit from drybrushing and washing which are the main techniques I have employed here. The models were basecoated with a 50/50 mix of Leadbelcher and Tin Bitz. After this they were drybrushed Leadbelcher before being washed with Nuln Oil followed by Agrax Earthshade. A quick drybrush of Necron Compound brought them to the stage you see here. Not bad for an afternoon’s work. Now all I have to do is paint in the details. 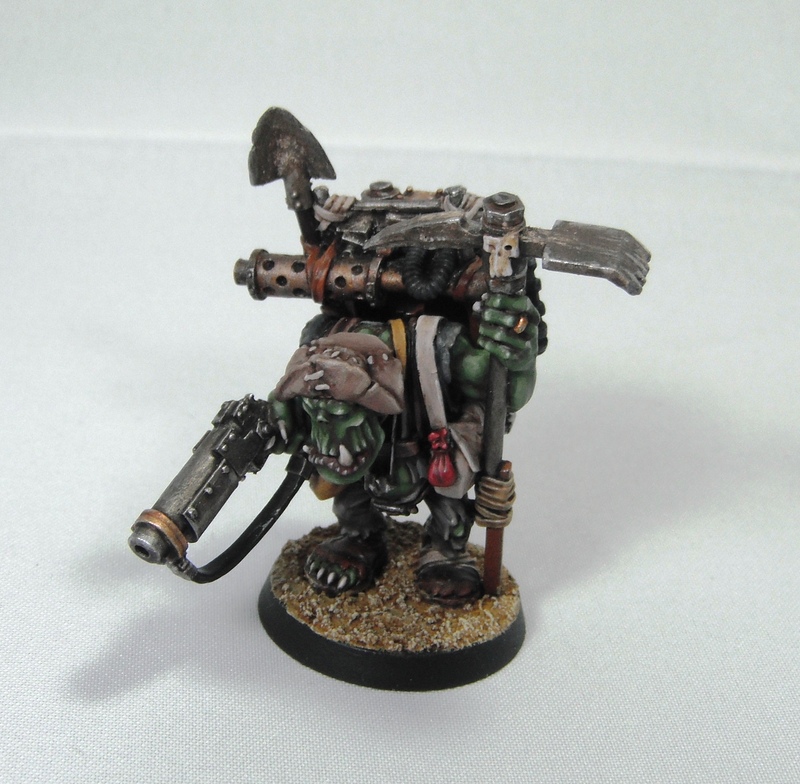 This is one of my favourite Games Workshop models of all time, Nagrub Wurrzag, ork scrap prospector. This is an old model from GW’s Gorkamorka range which has been in my collection for many years but I’ve only just got around to painting him. 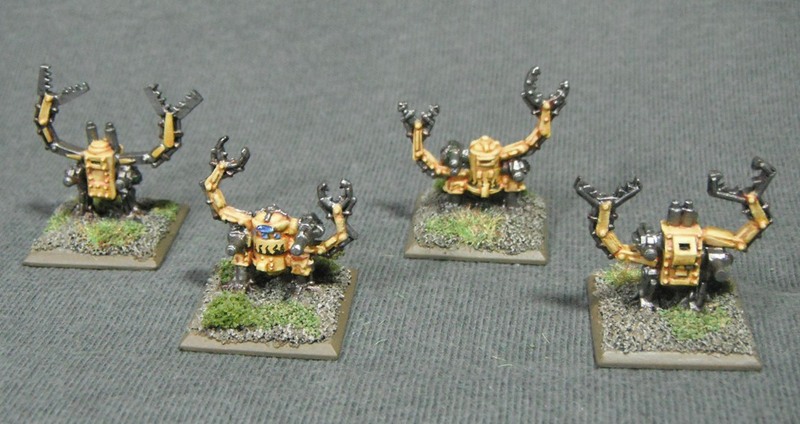 However, reading some old White Dwarfs has reignited my interest in Gorkamorka and so I thought I would paint up a few models with the hope of maybe getting a couple of games in at some point. 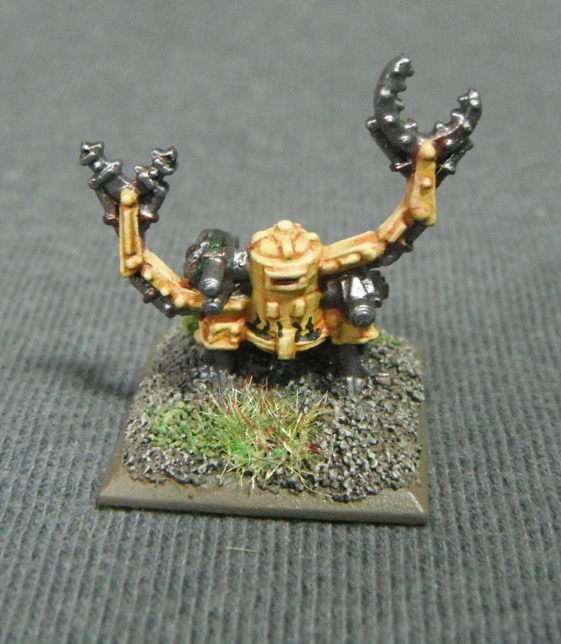 I kept to a fairly muted natural palette like the original Gorkamorka models. 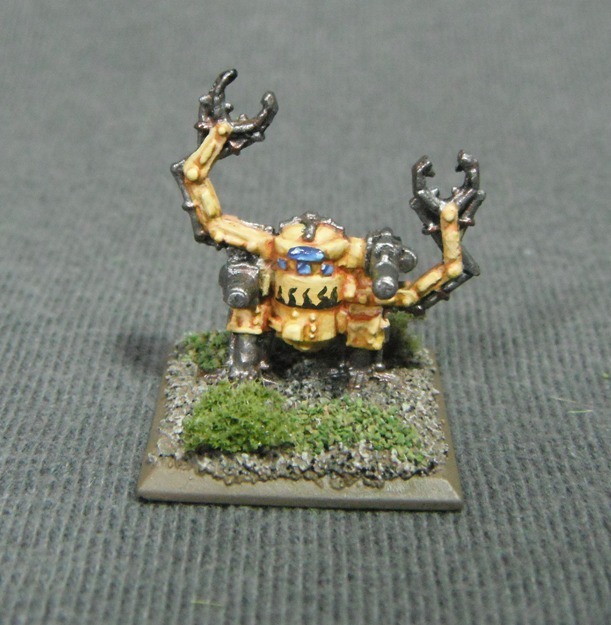 Keep checking the blog for more Gorkamorka models soon. Recently I have been working on a couple of different projects. 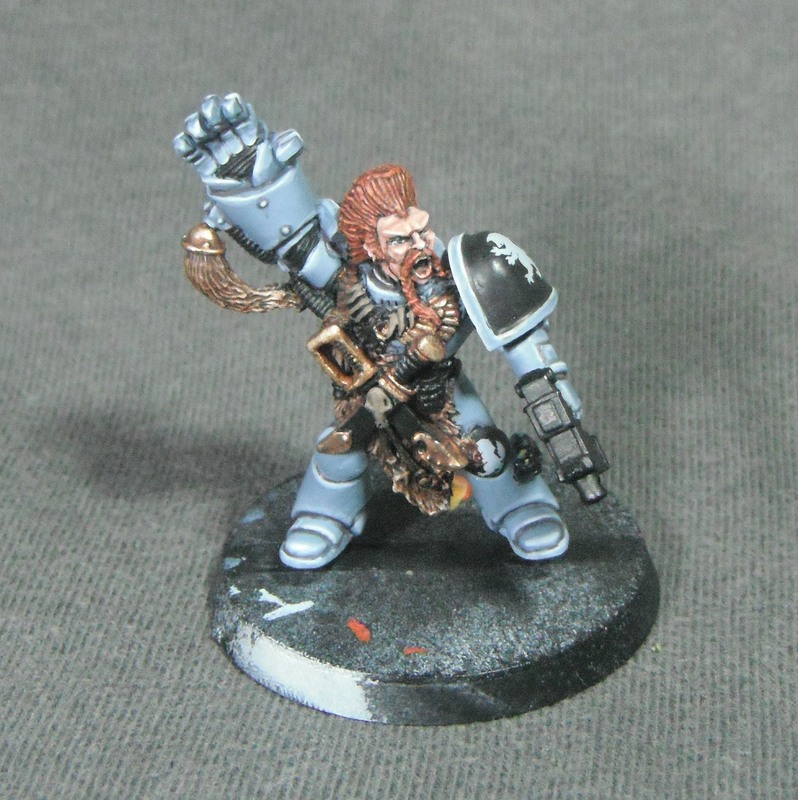 Firstly, I have returned to the Space Wolf which was started some time ago. Initially I was dissatisfied with this model and it sat on my desk untouched because I couldn’t quite work up the motivation to finish it. However, I have worked out what it was about the model that I wasn’t happy with; the warm yellow colour on the shoulder pads clashed with the cool blue/greys of the rest of the piece. Because of this I decided to go back and repaint the shoulder pads black and add the heraldry of Logan Grimnar’s Great Company (which came from one of GW’s new Space Wolf decals). I think this decision has really paid off and the whole model looks a lot better for this change. I have not always been a fan of using decals on miniatures. There are a number of problems which can occur with them if not applied correctly which can ruin a model. Firstly, the backing material shows up as a faint glossy outline making the decal very obvious and, secondly, they do not always follow the contours of a model and can look creased or uneven. Fortunately there are a couple of tricks which can be employed to combat both problems. The first trick for successfully applying decals I learned from Imperial Armour Model Masterclass vol 1. Apply a coat of gloss varnish to the surface where you wish to place the decal. This serves two functions: 1) it provides a smooth surface for the decal and prevents the problem of having air bubbles trapped underneath it. 2) it helps to hide the glossy outline of the decal. 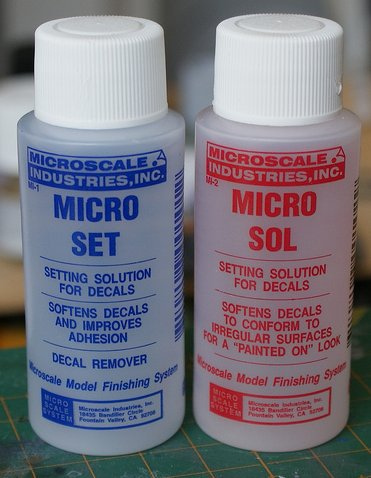 Second, Model Scale Industries produce two products specifically designed to help with the applications of decals. These are Micro Sol and Micro Set. These help to soften the decal and make it more malleable so that it fits the contours of a model. Begin by applying a thin layers of Micro Set over where you want the decal to be. Then place the decal on top and slide it into position using a damp brush. You can then use a brush loaded with Micro Sol in order to soften the decal and shape it to the model. You have to be careful when doing this as the Micro Sol actually melts the decal and can make it very fragile and easy to tear. Once the decal is positioned leave it to dry and then apply a second coat of gloss varnish. This both protects the decal and completes the process of hiding the glossy film around the edge. Once the gloss varnish has dried I dull it down with matt varnish. For this I use a bottle of brush-on Testor’s Dullcote Lacquer, although any matt varnish would do. I prefer the brush-on varnish rather than the spray as it gives you a greater degree control but it’s up to you which kind you use. For the Space Wolf the varnish actually ended up being a little rough looking and so I sanded to down with very fine emery paper (Tamiya’s p2000 finishing paper). Anything too abrasive will simply sand away all your hard work. 1)Basecoat the red areas with Mephiston Red (you may need to use 2-3 thin coats to ensure even coverage). 2) Highlight this Blood Red. 3) I then washed it with Baal Red and shaded the recesses directly with Devlan Mud. 4) Then I layered it up with a several thin coats of Blood Red in order to produce a vibrant red. 5) This was then highlighted with Blazing Orange followed by small edge highlights of Vomit Brown ( a nice yellowy-brown colour, pure yellow would be too bright) on only the most prominent raised areas and sharp corners. Be careful no to overdo it or the whole model will look too orange. Tomorrow I’m off to Grasmere for the week in order to do some work with Wordsworth’s manuscripts but when I get back I will try and get these finished. Despite the lack of updates this month I have not been totally idle. 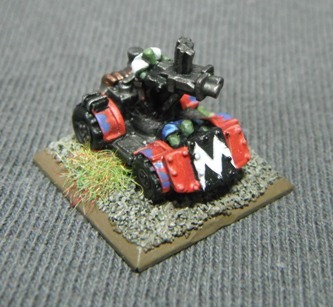 I have finished painting up the first of my Kult of Speed formations for my orks. These are really nice detailed models from the Epic 40k era and were a joy to paint. First of all the models were painted with Boltgun Metal followed by Washes of Badab Black and Devlan Mud. Over this I applied Mephiston Red to the armour plates and highlighted them using Blood Red followed by Sqig Orange. 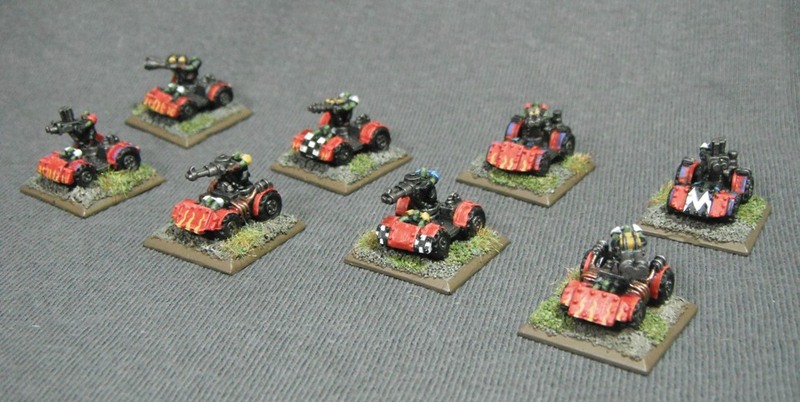 I then embellished the buggies with a bit of freehand in order to add some more visual interest to the models. This mainly took the form of dags, checks and yellow flame patterns. It hasn’t just been the Evil Sunz that have been receiving attention this month. 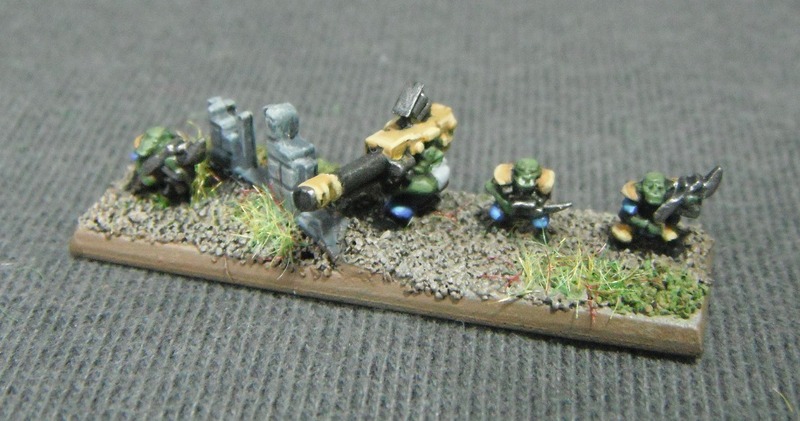 I also painted some Gun Wagonz for my Bad Moonz. So far I only have four finished but I plan on adding more along with some Oddboy characters and some flakwagonz. In other news, I am experimenting with social networking and Miniature Miscellany is now on Twitter. Hopefully this will allow me to keep you updated on what I’m doing when it doesn’t warrant a full blog post. You can follow me or contact me, should you so wish, @Mini_Miscellany on Twitter. The Twitter feed will also be visible on the Miniature Miscellany homepage. 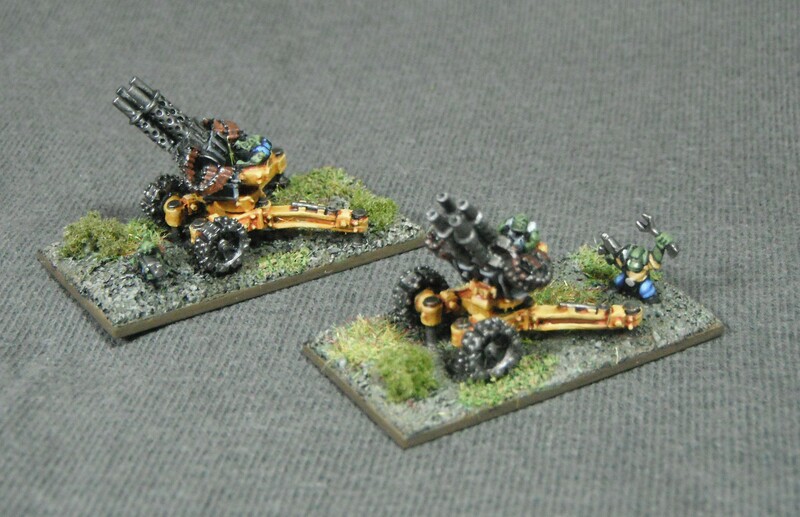 Here are some flak gunz for my Bad Moonz. I wanted to include some AA fire but I didn’t particularly like the idea of including vehicles in an all infantry formation. 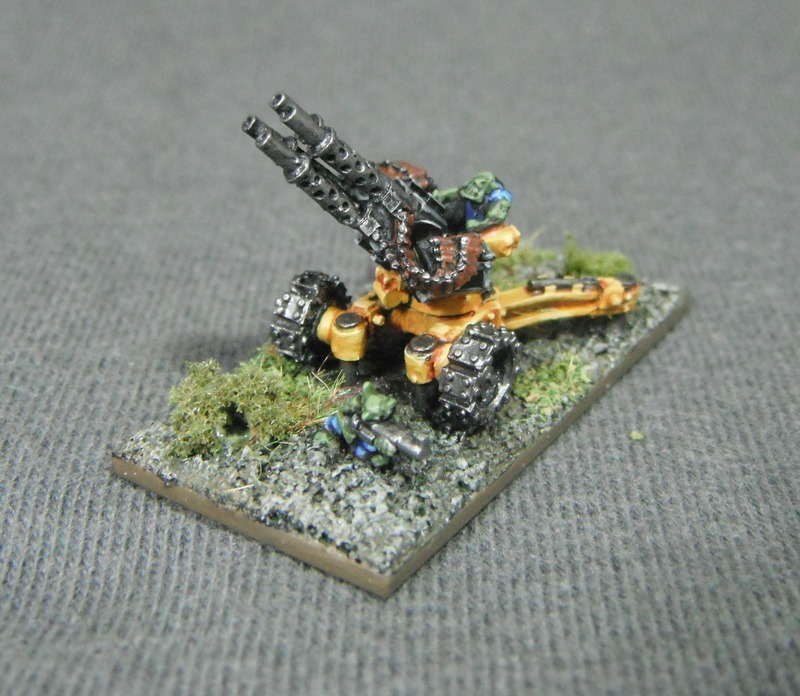 Fortunately Forge World sells these mounted Flak Gunz for their Aeronautica Imperialis range which fulfill the role perfectly. 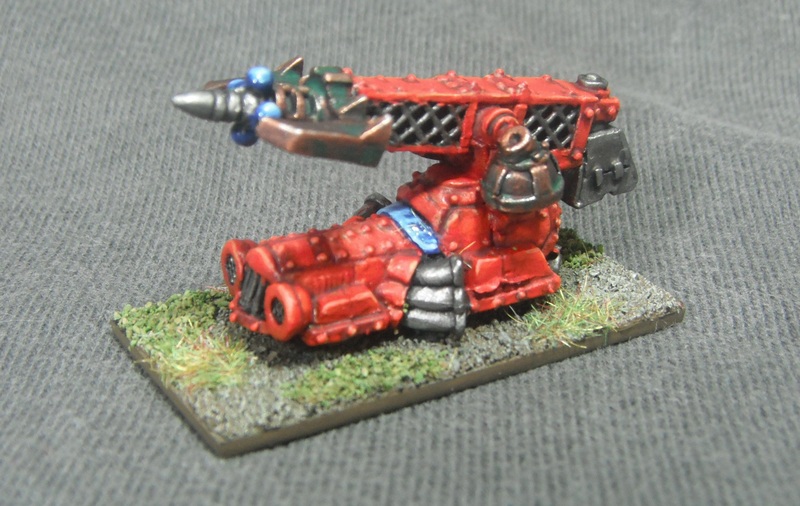 In a game I will simply count them as Flak Wagonz. Next I might take a break from painting all this yellow and work on a different clan. I have finished my first submission for the ‘Tale of Epic Gamers’, Da Killin’ Moonz. Here are four stands of nobz which complete my Big Mob giving me my first legal formation for my ork army. Well, I say finished, I have left the banners black at this stage because I haven’t decided exactly what to do with them. I was planning on applying some decals but the decals I have are very old and will not come off the sheet. Have other people experienced this problem? 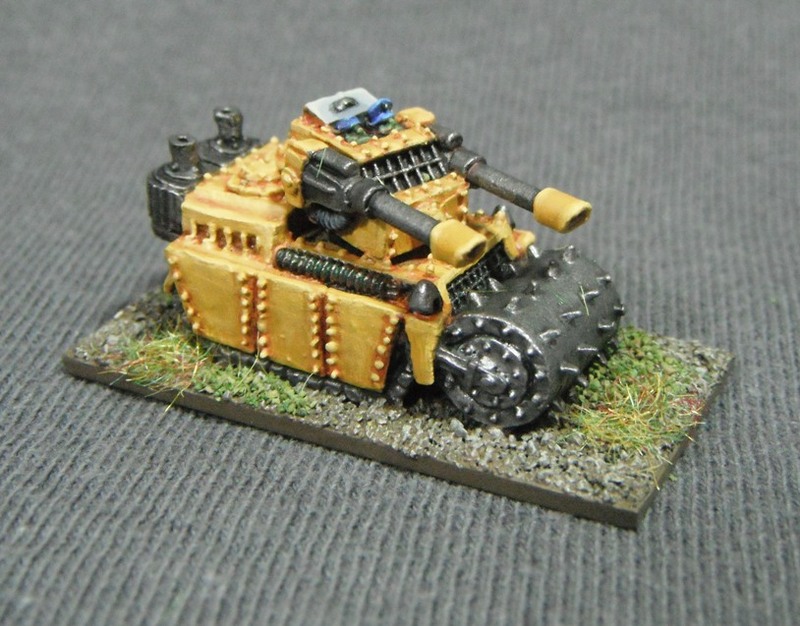 I think I might buy some of the new Forge World ork decals to replace them. Does anyone know if any of the decals on the sheet are the correct size for Epic? I plan on adding some flak to this detachment but that will have to wait until next month now. I’ll post pics as soon as they are done. Ahem, sorry about the interruption. These guys are probably just being impatient due to the fact they have been sat on my desk for some time now while I’ve been putting the finishing touches to some of my Eldar. 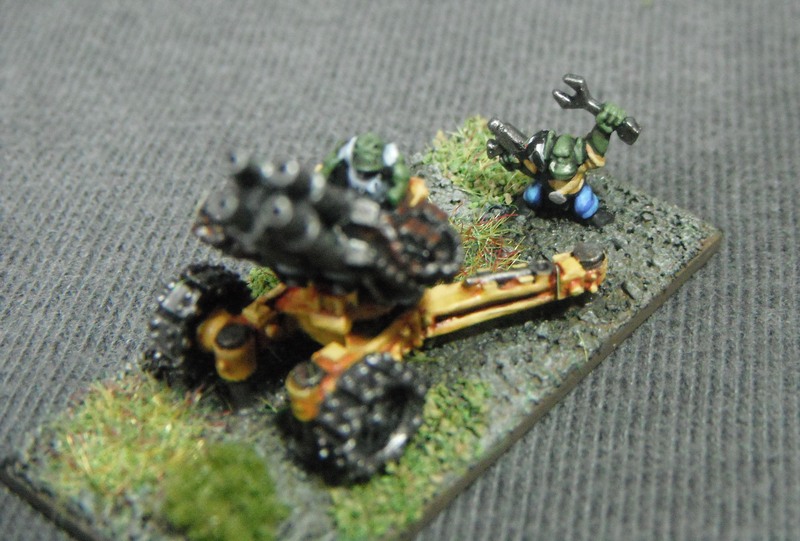 However, I though it was time to photo some of my orks. These are for my ‘Tale of Epic Gamers’ thread over on the Tactical Command forum. 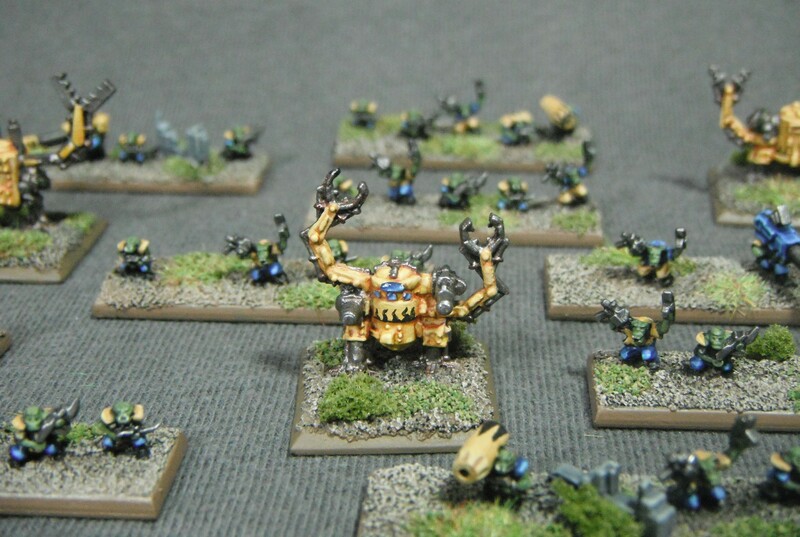 The ‘Tale’ is a group painting project designed to inspire Epic players to get their armies painted by painting up 500 points blocks on a monthly basis. Hopefully painting up my army alongside some talented painters on the forum along with the challenge of monthly deadlines will help me stay motivated throughout this project and paint up a force. 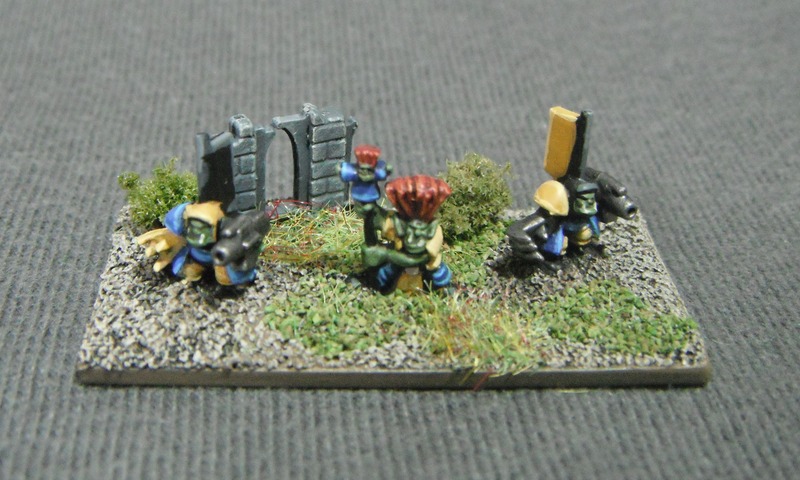 First up is a ‘big mob’ or orks. 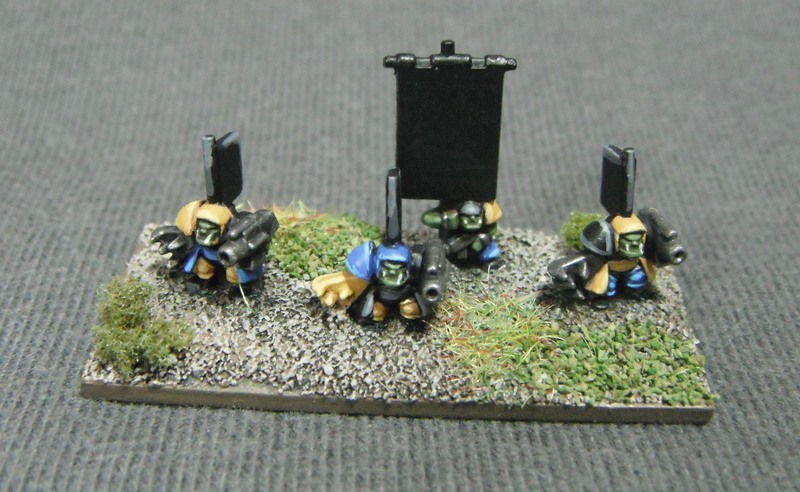 Unlike the strict compositions of Eldar formations, ork formations come in three basic sizes ‘normal’, ‘big’ and ‘huge’. 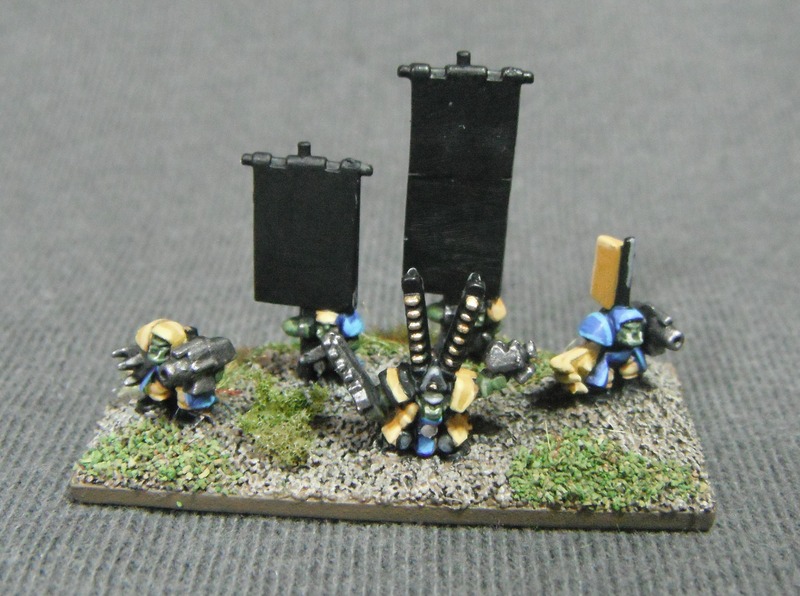 These take the basic formation (two nobz, six orks and four grots) and double or triple it in size. In addition to this you can add all manner of upgrades which can be added in virtually any combination. For this formation I have added some dreadnoughts in order to give the formation extra punch in assaults.They were painted using my usual technique for painting yellow. I think the bright colour works really well and certainly makes these models stand out on the table. 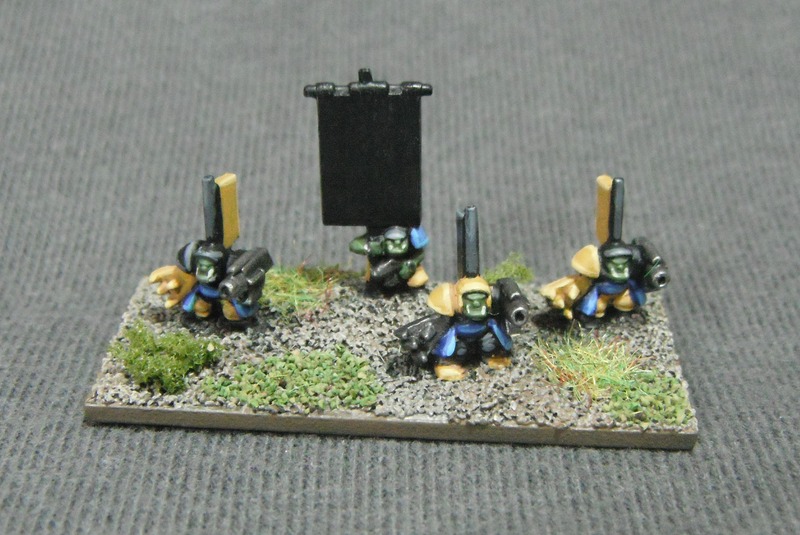 Here are a few pics of the infantry stands just to get an idea of the variety of the ork models. These follow the same paint scheme as my test models. I am particularity pleased with how the Runt Herder came out. There are no rules for a lot of the ork characters which were released for Epic 40,000 but they add diversity to the regular stands (and ork armies should be nothing if not diverse). These were quite fun models to paint up and I think they look great all together. I only have four stands of nobz to paint now and I will have my first legal formation for my ork army. 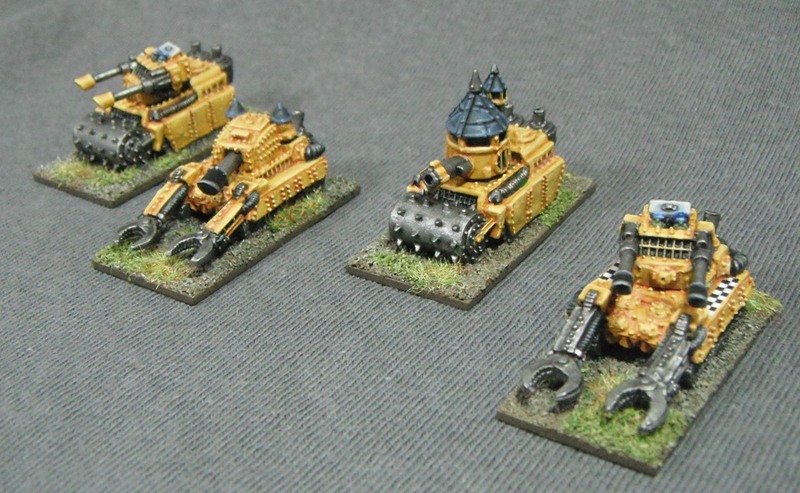 Here are a few models that I painted up in order to test my colour scheme for my orks. I opted for the traditional yellow and blue colours of the Bad Moonz klan. I am happy with the look of these models and plan to roll out the colour scheme for the whole formation. These models are also noteworthy as they are the first models that I have painted using the new Citadel paints and I have to say that I was very pleased with them. 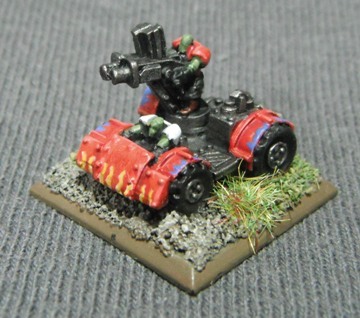 Here you can see the new paints that I used for painting the orks’ skin. 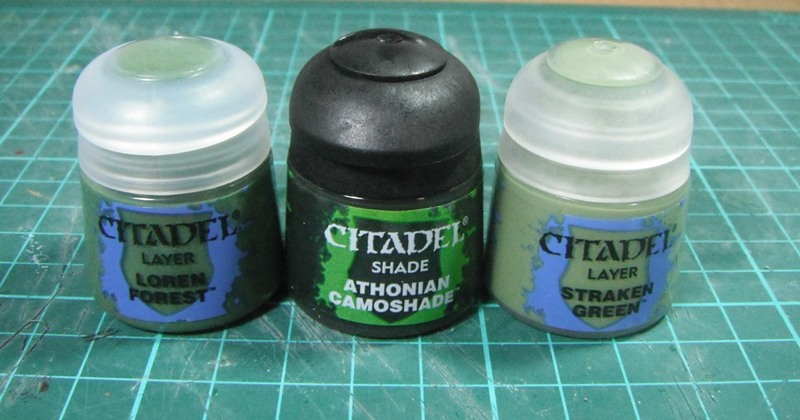 I chose these colours as they are really nice natural muted greens rather than the bright garish greens you sometimes see on orks and this fits my style better. I based the skin with Loren Green and washed this with Athonian Camoshade. When this was dry I highlighted the orks using Straken Green, a colour that is specifically designed as a highlight for Loren Green. Having different variations of the same colour like this really makes army painting easier. The paints themselves were very smooth and provided good coverage. The new paints come in pots that are superficially similar to the previous edition paints although GW have fixed the problem of the pots not staying open by themselves which is a very welcome change (no more sticking bits of sprue under the lid to hold it open). Just a quick post to share what I’ve been up to recently. 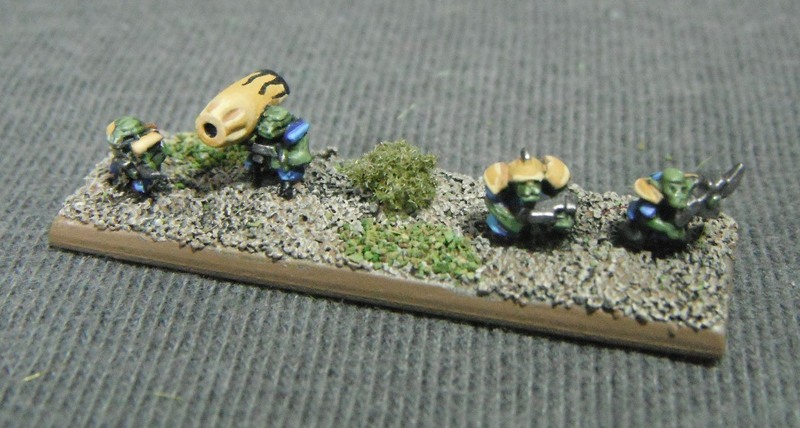 I’ve been spending my time cleaning and (re)basing some ork units for Epic. I’ve always liked the idea of fielding a huge army of greenskins but knew that painting up all of those models for Warhammer or 40k would be impractical for one with my painting speed. However, Epic is the perfect game system for fielding ‘horde’ type armies. 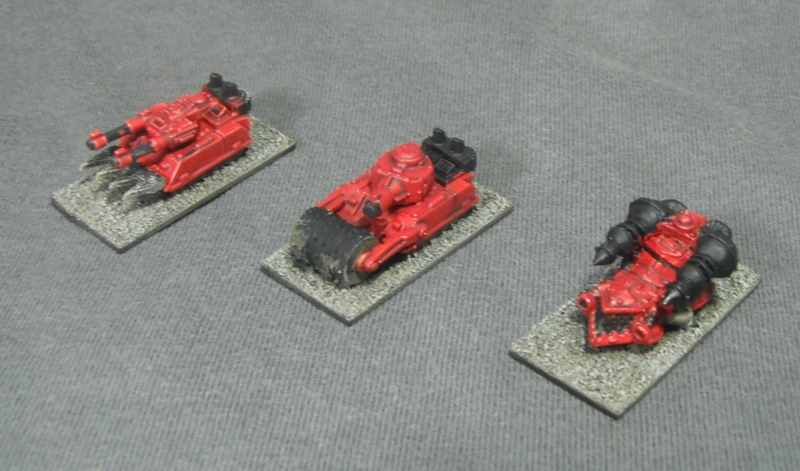 The models shown here were picked up on ebay and are a combination of the Space Marine era ‘Ork Invasion’ and ‘Ork Horde’ boxed sets along with the Epic 40k era ‘Ork Mob’ set. Together these offer a huge variety of different troop types and orks in different poses. I have combined ork boyz from different sets along with some of the obsolete troop types in order to create a suitably rag-tag look to my stands; after all, you don’t want orks to end up looking too unified. The inspiration for this came from Curtis’s orks over on Ninjabread and also Nico’s models on Realms of Chaos (both excellent blogs which are well worth checking out). 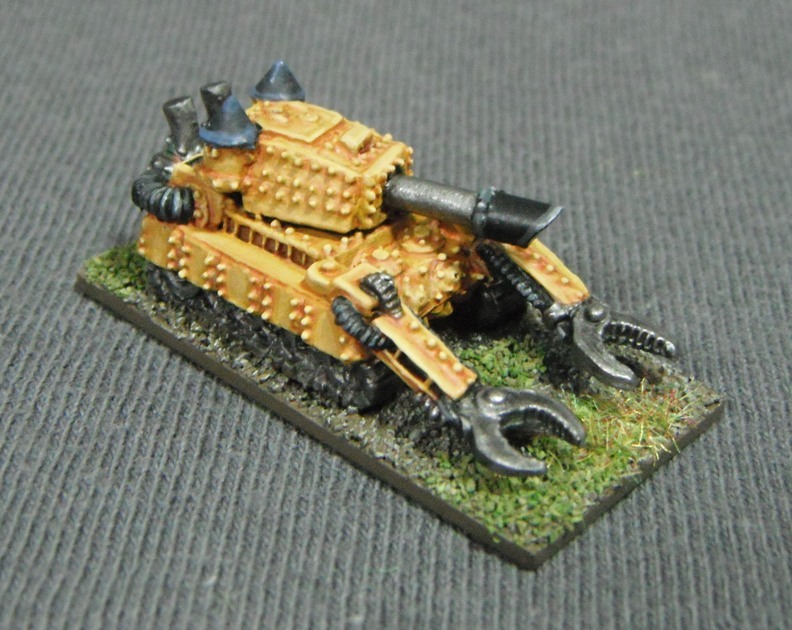 Another source of inspiration was Carl Woodrow’s orks which can be seen on his old website Dropship which I’ve mentioned before here on Miniature Miscellany and is a great source for all things Epic. 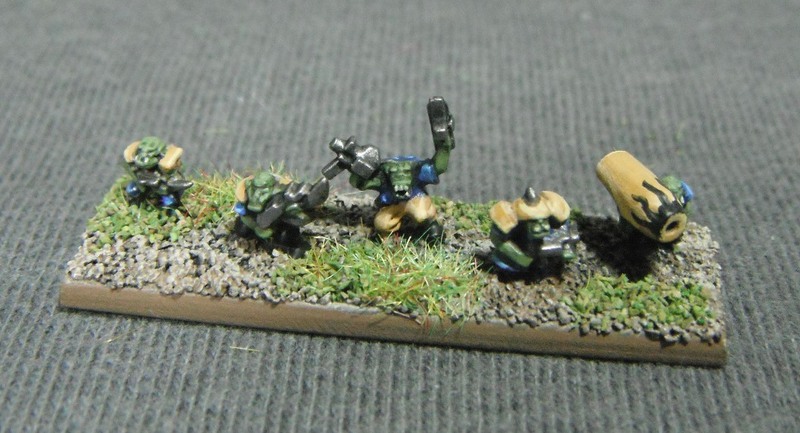 When it came to basing the orks I wasn’t sure whether to use rectangular or round bases. Part of me thought that the orks would look better on round bases as this would make them less uniform (such as Curtis and Nico’s orks). However, in the end the decision was pretty much made for me as I have a box containing over a hundred of the Epic 40k strip bases and numerous square bases from older versions of Epic. As I had all of these bases to hand it seemed only sensible to use rectangular bases. 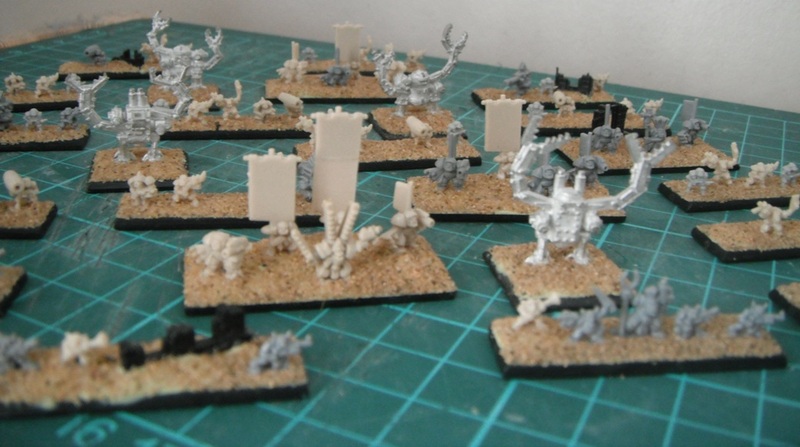 In addition to this a combination of strip, square and Warmaster bases would provide me with enough different size bases for all of the diverse troops and vehicles while still remaining visually coherent on the tabletop. 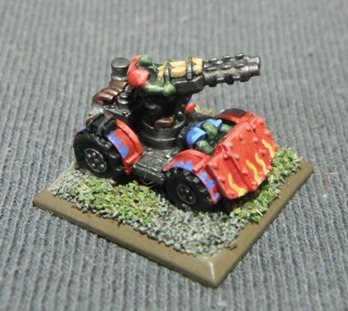 So far I have based enough orks for ‘Big’ mob (ork formations are either ‘Normal’, ‘Big’ or ”Uge’) along with enough buggies and warbikes for two normal Kults of Speed or one big one. I also have a couple of Stompas and an assortment of infantry and big guns still to assemble which should provide me with a good starting point for a decent sized Waaagh!